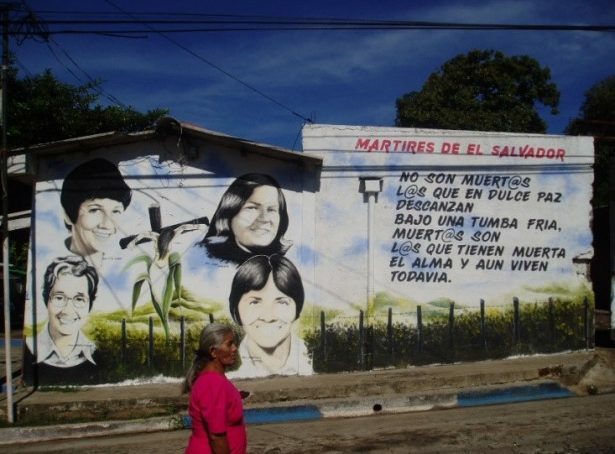 I write to you today on what the world celebrates as World AIDS Day and just a day before our IPM delegation in El Salvador joins thousands of others commemorating the December 2, 1980 martyrdom of Maura Clark, Jean Donovan, Ita Ford, and Dorothy Kazel in El Salvador. Each World AIDS Day brings me back to the early 1990’s when the spread of HIV&AIDS was ravaging the African communities I was working with through my time with Caritas Internationalis, the migrants forced into sexual exploitation in Rome, and the lives of my gay friends back in the USA. I am reminded of how slow my church of that time and the government of the USA were to respond—a delayed reaction grounded in bias against marginalized peoples that would lead to the unnecessary death of millions. Similarly, each December 2nd, brings me back to that morning in high school when I first learned that Cleveland-based Ursuline Sister Dorothy Kazel and lay Missioner Jean Donovan were missing, that evening when my mom spoke to me about Dorothy, and the following day when we first learned of the brutality of their murder by Salvadoran forces unleashed by the incoming U.S. Administration. At 15, I remember struggling with what their deaths meant for my sense of vocation and the life-shattering notion that the Catholic Church I had grown up in was in direct conflict with US Policy. The four of them, like each of IPM’s Partners, help center and ground me when it feels like life is overwhelming, that justice is still a far off dream, and that peace is the farthest thing from every step. It can feel like that right now can’t it? That the times we live in are no better than the ‘80’s, that our political system is broken, and that a nuclear holocaust on the Korean peninsula is just around the corner. a changing philanthropic climate where everything seems to be more about metrics than the transformational change global solidarity can make in each individual’s life. These are indeed times when one’s faith and commitment are being tested in unimaginable ways! But like all such times, this is also a moment when organizations like IPM and people like you can make an even greater difference in the world. You can help us in so many ways. Share the good news of IPM’s transformational work around the world. Bring a friend (or friends!) along on an IPM Immersion Experience Program. Join in one of IPM’s new advocacy campaigns to Defend DACA and stop the political violence in Kenya. Pray that our International Staff and Partners have the courage and strength to continue their life-changing efforts to bring justice, peace, and hope to the abandoned and forgotten. Donate your time, talent, & treasure to make our mission possible. This is just some of what you can do. It’s much of what my colleagues and I try to do each and every day emboldened by the notion that “it is not the years in your life that count it’s the life in your years,” (Abraham Lincoln). And years like these require all the life we can give! As I write this letter, our nation and our world may feel even more divided than they did last year. But people of faith and communities worldwide are standing up and reminding us that another world is indeed possible. That fear and hate can’t rule the day. That hope and love always win in the end. That the mission of IPM to work across border of culture, faith, and economic circumstance is needed now more than ever. Sometimes, at our darkest moments that might be hard to believe. But I believe and I know that you wouldn’t keep supporting our work together if you too didn’t know that you can make a difference! Your partnership with us provides IPM with the resources to accompany and nurture tens of thousands of people of who have taken up the challenge of living with and loving one another… of making our world and their communities a place where everyone is valued and no one is forgotten. Thank you and best wishes to you during this Holiday Season and throughout the coming year! Keep IPM central to your prayers and/or meditation practice so that the shared power of human hearts and mindfulness can continue to make a difference in our world. Thank you!